with Grade Pay ol Rs. 1.900/- in Southern Railway as detailed below. 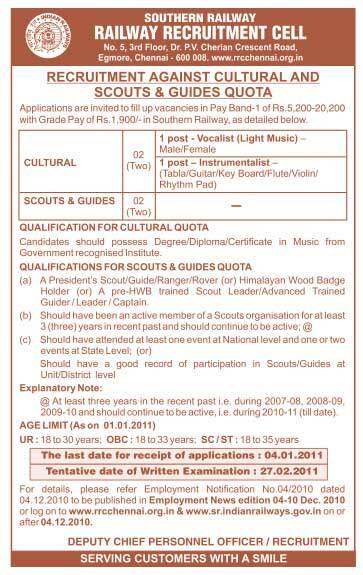 Candidates should possess Degree/Diploma/Certificate in Music from Government recognised Institute. @ At least three years in the recent past i e during 2007-08. 2008-09, 2009-10 and should continue to be active. i. e during 2010-11 (till date). 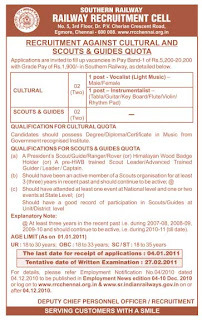 For details, please refer Employment Notification No.04/2010 dated 04 12.2010 to be published m Employment News edition 04-10 Dec. 2010 or log on to www.rrcchennai.org.ln & www.sr.indtanrallways.gov.in on or after 04.12.2010.